Semi Automatic Ropp Cap Sealing Machine Is N.K Industries Solution For Start Up Industries Where They Can Efficetly Cap The Bottle At Lower Capital Cost. 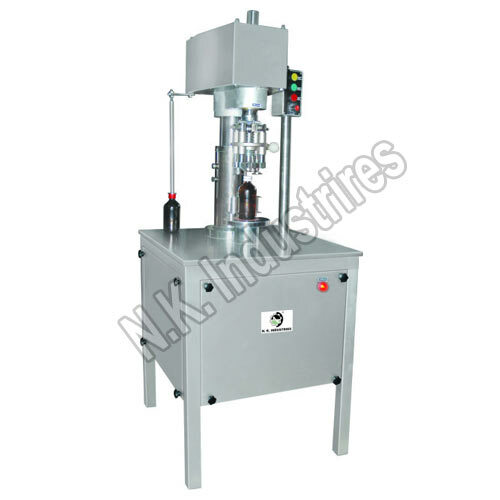 Single Head ROPP Bottle Cap Sealing Machine Is Used To Apply The Pilfer Proof / ROPP Cap / Aluminium Cap On Bottle. It Can Deliver The Output Up To 50 Bottles Per Minute. Our Range Of Multi Head Rotary Ropp Cap Sealing Machine Comes In Various Configuration According To Production Capacity Requirement Like 4 Head Ropp Cap Sealing Machine , 6 Head Ropp Cap Sealing Machine, 8 Head Ropp Cap Sealing Machine ,12 Head Ropp Cap Sealing Machine.